As a dedicated Google My Business manager for over 160 clients across the US and Europe, Lift Conversions takes great pride in the results our listings bring in each month. As a Google Partner, that should come as no surprise, but some of the numbers might surprise you. Of course, the most important factor is that the listings are live and error-free. 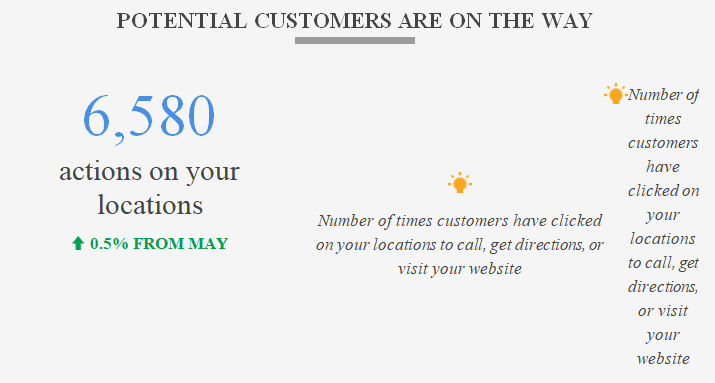 That takes some serious work when our clients have over 300 total locations under our umbrella. That’s a great deal of checking each month to be certain our clients are easily discoverable and their listings are disseminating the information we want them to – complete and correct. Now, we’re moving into the real numbers behind our managed listings and it’s clear that our clients have been performing exceedingly well. Almost half a million views in 30 days is nothing to scoff at. In fact, it represents more than 1,000 views per location per month, or, to state it more plainly, more than 33 per day! We saw a slight dip from May’s numbers, but nothing that concerns us as it was less than 1%. And, it was counterbalanced by the next number we’ll discuss – actions on our listings. 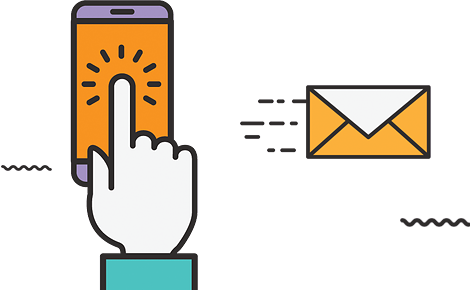 When we say actions taken on our listings, we’re referring to customers clicking the listing to call directly, getting map directions, or going straight to the client’s website. So, these actions are legitimate conversion opportunities for nothing more than having a well-designed, fully-completed listing actively managed by experts. It’s affordable, reliable, and as evergreen as the web can be. After all, Google isn’t going anywhere anytime soon, so taking full advantage of what they offer your business is vital to your lasting success. 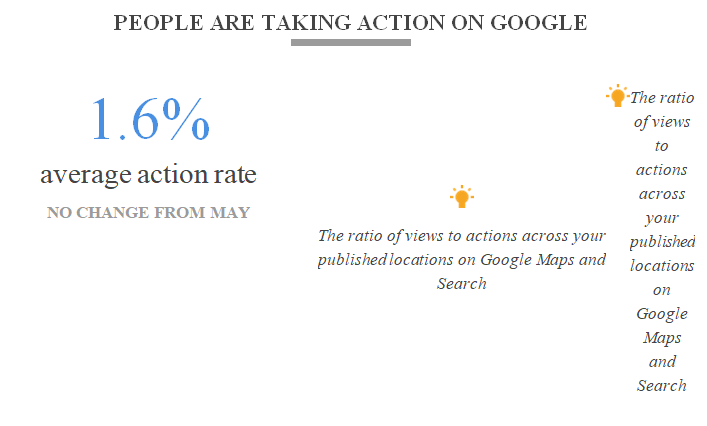 The final metric provided from our June Google My Business efforts is a kind of click-through rate for listings. While it’s not nearly as important in its sphere as CTR is in AdWords, it still gives a decent indication on the ratio of views to confirmed actions. However, we always tell clients to take this percentage with a grain of salt as it’s a bit misleading. After all, if a small town shopper is looking for an address, they may not need directions to get there. This is also true for bigger cities, so it’s really more of a baseline we use to ensure activity is taking place instead of a true reflection of the actual benefits seen from a listing managed by Lift Conversions. If you’re curious to see what Google experts can do with your Google My Business listing, contact Lift Conversions by calling (773) 419-3636 or by emailing us directly at info@liftconversions.com. We’ll gladly walk you through our process and pricing to find the perfect management plan for you. It’s affordable, effective, and will continue to work for you for as long as you own your business. So, why wait another day? All you’re losing is opportunity!